Japanese Journalist Is Freed After 3 Years As Captive In Syria Jumpei Yasuda was taken hostage by al-Nusra Front, the al-Qaida affiliate in Syria, in 2015. Japanese officials say he was freed on Tuesday and is now in Turkey. 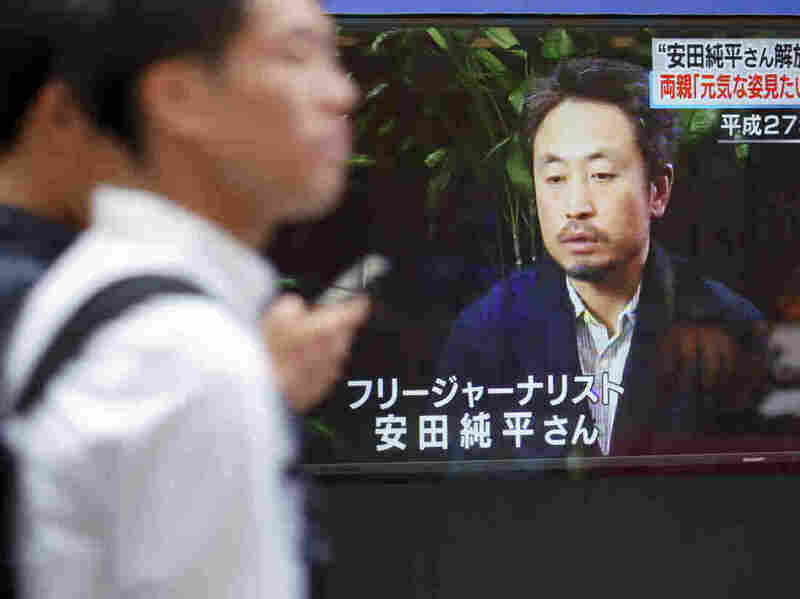 Men walk past a TV screen showing a news program with an image of Japanese freelance journalist Jumpei Yasuda, on Wednesday. Yasuda, who disappeared three years ago in Syria, has been released and is now in Turkey, a Japanese official said. Japan's government has confirmed that a Japanese journalist who was reportedly taken hostage in Syria in 2015, has been freed and is now in Turkey. Foreign Minister Taro Kono says Japanese diplomats met with 44-year-old Jumpei Yasuda at an immigration center in Antakya, in southern Turkey. Yasuda has been there since being freed on Tuesday. Kono said Yasuda appears to be in good health. Tokyo says news of Yasuda's release came from Qatari officials late Tuesday. Speaking to reporters, Prime Minister Shinzo Abe thanked Turkey and Qatar for their assistance in Yasuda's case. The case of Yasuda and others like him has sparked debate in Japan about its role in international affairs, the role of freelance journalists, and of citizens in foreign policy. Yasuda gave up a steady job at a regional newspaper to report from the Middle East as a freelancer. He was held hostage in Iraq in 2004, before Muslim scholars helped negotiate his release. In 2015, he entered Syria, hoping to report on the fate of a colleague, Kenji Goto. Goto was taken hostage by the Islamic State group that year, and when negotiations collapsed, they beheaded him. Yasuda, meanwhile, was taken captive by the al-Qaida-affiliated group, known at the time as the al-Nusra Front. The group has since changed its name to Hayat Tahrir al-Sham. The Japan Times has reported that the group demanded a $10 million ransom to secure Yasuda's release. Tokyo insists that it did not pay for his freedom in accordance with government policy. In 2016, a video came out, purporting to show a bearded Yasuda reading from a script. He told his family he loved them, and hinted at the nature of his ordeal. Locked up and suffering in a dark room, he said, "there is no one answering, no one responding. You are invisible. You do not exist. No one cares about you." How Yasuda was freed remains unclear. Qatar has previously used its connections in Syria to help free other hostages, including American journalist Peter Theo Curtis, who was released by the al-Nusra Front in 2014. As Japanese officials worked to verify Mr. Yasuda's identity, his family waited anxiously. State broadcaster NHK interviewed Yasuda's 75-year-old mother, who related that she folded around 10,000 paper origami cranes, at least one each day, while waiting and praying for her son's safety. Both Yasuda and his less fortunate colleague Goto have been criticized in Japan for undermining the country's foreign policy. Their critics have portrayed them as amateurs who got into a tight spot overseas, necessitating their government to bail them out. Japan's government reportedly refused to pay for Yasuda's trip home after his release in Iraq in 2014. Japan's role in Middle East conflicts has been largely limited to humanitarian assistance. Its U.S.-drafted, post-war constitution bars it from having a standing army. But as the world's third-largest economy and a key U.S. ally, Japan has pushed for a larger role. This has led some Japanese to question exactly what their country is doing in the Middle East. Yasuda has indicated that, as a journalist, that's exactly the question he has felt compelled to examine.